My favorite country was, surprisingly, Albania. Just about everyone told me not to go there, as they believed it to be unsafe. But once I got there I really loved it. The land was beautiful, the people were kind, and the food was fantastic (as were the prices). I think I liked Albania more than any other place largely due to the fact that it was the least touristy country I visited on the entire trip. This alone made me feel good – like I was having an authentic travel experience. I’d love to go back and see more of Albania before it becomes too much like the rest of the EU. I’d also like to give a shout out to Macedonia as my second favorite country. I have to admit that I didn’t have high expectations for this tiny country nestled north of Greece and east of Albania, but it turned out to be one incredible place. The land wasn’t nearly as unique as that of Croatia, Albania or Switzerland, but the people were so incredibly nice, the history was fascinating and the mix of old and new was unlike any other place I have ever been to before. There wasn’t any one place that I wouldn’t go back to. In fact, I liked just about every place I visited this year. But if I had to call out a single country as my least favorite, it would have to be Montenegro. After living in the country for nearly a month-and-a-half, I got used to the place and it actually started to grow on me. 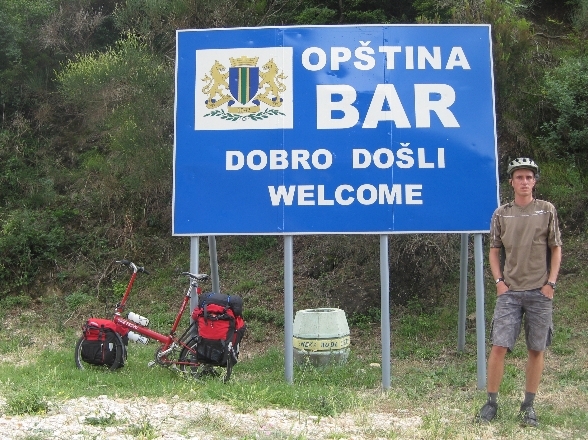 But life in Montenegro took longer to get used to than any of the other 15 countries I visited. Half of me loved Montenegro and the other half hated it. Surprisingly, no. Even though I spent nine months almost completely by myself and couldn’t understand 90% of the people I came in contact with on a daily basis, I never really got lonely or homesick. That said, this was my ninth long-distance bike tour and having traveled by myself in the past, I’m pretty used to being alone and taking care of myself. If this had been my first long bike tour, I’m sure I would have indeed been very lonely and homesick at times. It might come as a surprise to some, but my favorite meal was found in the tiny town of Strumica, Macedonia. If you are ever find yourself in this delightful little city, be sure to visit Elizabet’s Pizzeria (near the city park) and order yourself a vegetarian pizza pie. This particular pizza is, if I may say so myself, absolutely fantastic! Spicy, filing, and incredibly affordable (about $5 USD as of this writing). I also have to mention that Germany and Austria had the best bread I’ve ever had in my life and it was relatively inexpensive. The bread in Montenegro, however, was completely inedible. I didn’t eat bread for the rest of the trip after I left Montenegro. That’s how bad it was. It was so bad, in fact, that I still get a little anxiety every time I eat bread now. It was really, really bad! What Country Would You Want To Go Back And See More Of? I’d also love to go back and see more of Croatia and Albania. If You Could Live In Any One Of The Cities You Visited On Your Bike Tour This Year, Which One Would It Be? I spent the first two months of the year in Luzern, Switzerland and this place, more than any other, really felt like home. I liked the people, the culture, the landscape, and the city’s fantastic location in the center of the country. I think it would be very easy for me to move to Luzern and feel at home there. I also think that Vienna, Austria would be a great place to live. I not a fan of big cities for the most part, but Vienna is one fantastic place. There is so much to see and do in Vienna and I could see myself being very happy there as well. Other large cities I enjoyed, but had never heard much about previously were Ljubljana, Slovenia and Zagreb, Croatia. Did Anyone Harass You For Being An American? Many American travelers are afraid and/or ashamed to admit that they are American. They fear that because of what is going on in the world right now, people might not treat them so well. I understand why they might think that way, but I knew early on that I wasn’t going to hide the fact that I was from the United States (No, I never told anyone I was from Canada). When people asked where I was from, I usually told them I was from California (rather than the United States (This is true. I am from California, but I now live in Utah. I don’t tell people I am from Utah, because hardly anybody knows where Utah is. However, just about everyone knows where California is)). But you know what? I didn’t get a single negative remark when I told people I was from the States. I found it surprising that even in Kosovo the locals seemed to applaud when they learned that I was from the U.S. of A. The only place where I was ribbed about being from the United States was in Athens, Greece when I ran into a man walking through the park around the Acropolis who said he too was from the U.S. but that he had been living illegally in Greece for a number of years and that he would never return to his home country. He went on for a few minutes about the taxes, our country’s policies on torture and the fact that he (and I) have failed to ever meet a terrorist in our entire lives. He made some good points, but I found it amusing that the only time in a 9-month period when I was harassed about being from the United States, it was from another U.S. citizen. The only country where I did not notice a massive shutdown on Sundays was in Montenegro. Here, many of the shops were still open on Sundays and life seemed to go on like normal. What Was It Like To Work While You Were Traveling? When I set out on this trip my main goal was to “work smart.” To me, that meant only working on the most important tasks and not creating busywork for myself so that I could spend the majority of my time out exploring and experiencing the culture. Now that the trip is over, I realize I didn’t do a very good job with my goal of working smart. I did get a lot of work done while I was in Europe, but I did fall into the trap of working too much… and spending too much time on tasks that were ultimately unimportant. That said, I have learned a lot about working from the road (and time-management in general) and I plan to implement what I learned this year into my future travels, so that I can spend more time traveling and less time starring at the computer screen. Were You Able To Learn Any Languages While You Were There? The reason I started my tour in Switzerland in the dead of winter is because my goal for this trip was to learn as much of the German language as I possibly could. In the end, I spent three months in the German speaking countries of Switzerland, Germany and Austria. Unfortunately, I failed to become fluent in the German language. The main problem I had was that when meeting someone on the street or going into a shop, I would start up a conversation in German, but the person I was talking to (more often than not) would quickly realize that German was not my first language and they’d begin speaking to me in English. Because most people in these countries are better at English than I am at German, our conversations almost always drifted to full English dialogue. This was great for me because I could understand what people were saying and they could understand me, but this was also bad for me because I didn’t get to practice or learn as much German as I had hoped to. If I were to go back and live in any of these countries ever again, I think I would sign up for a class of some kind where I would be forced to speak and write in German on a regular basis. In other countries I only learned the basics. Words like “Please, thank you, hello, good-bye, yes” and “no” were just about all I learned in Serbian, Albanian and Greek. What Did You Like Least About Traveling In Europe? The thing I liked least about Europe was all the people who smoke. Germany and Switzerland were by far the worst in this regards. In these two countries, more than any place I visited this year, the smoking really got to me. For countries that seem to be so health conscious, I don’t understand why so many people smoke. I really wish they’d stop! Other than that, there were just small annoyances, such as poor Internet connections (which seemed to be consistently slower than what I am used to) and simply not being able to communicate at times or understand the menus and labels on food packaging. What Did You Like Most About Traveling In Europe? There were a lot of things I liked about Europe. Obviously, some of the countries have fantastic train systems and, as you likely know, cater so much more to bicyclists and pedestrians than we do here in the United States. That said, if I had to name a single thing that I liked most about Europe, it was probably the fact that everyone seemed so calm and relaxed compared to what I grew up with back in California. Here in the U.S. it oftentimes seems like people have a “Go! Go! Go!” mentality where everyone is rushing about, fighting to get from one place to the next, pushing to be the first, etc. But in Europe it was simply so much more laid back… and I really, really liked that. The other thing I liked about my trip to Europe was that I didn’t bring my cell phone with me and it was therefore impossible for people to call me when I was out exploring, riding my bike, or meeting people in the streets. This was a true blessing! Without my cell phone constantly going off and interrupting me, I found that I was less anxious on a daily basis and a whole lot less stressed throughout the trip. Now that I’m back home and have my cell phone again, I’m attempting to use it only an emergency device and rarely answer the phone when people call. I encourage you to try living without your cell phone for a while. Try it for a month and see how it changes your life. If you are anything like me, you might be surprised by just how much stress your cell phone is causing you… and how much its constant ringing distracts you from accomplishing the things you truly want in life. So, there it is! The answers to your questions on my travels in Europe. What do you think? Do you have any other questions for me? Most importantly, what do you find yourself thinking about after your travels have come to an end? 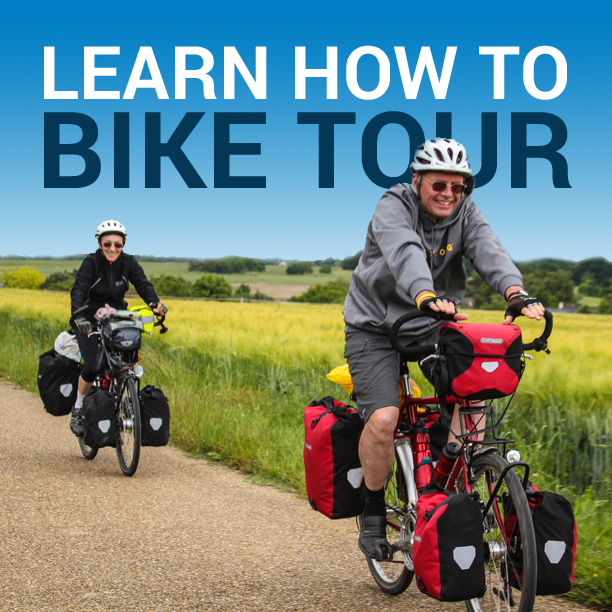 This entry was posted in Bicycle Touring Pro Articles, Europe, Featured How-To Articles, Lifestyle, Locations, Main Articles and tagged bike tour, europe, european bicycle tour, lessons learned, random thoughts, work an travel, working. Nice wrap-up to your Euro tour! I agree with your conclussions about learning another language. If you can find an intensive language class before going to the country, you will maximize your learning potential. My first German class was 8 hours a day for 8 weeks and no English allowed. It was the equivalent of 3 years of college level in 2 months. Another thing that really helps is to develop some good friendships with native speakers. If you can be part of the family while you are there and let them know you want to improve your German it helps a lot. They can also help you experience the real culture and avoid the touristy stuff. I’ve enjoyed following your trips, keep it up! Thanks! Darren- I’ve spent a few years in Europe, mopstly Greece and Turkey, and I surely miss the slower and casual lifestyes. I really don’t like this fast pace Americanism! I may end up in that part of the world again. As for cell phones, I have one and only use it for messages. I rarely leave it on unless I’m expecting an impotant call. Otherfwise the phone can be quite annoying. In all my travels in Europe and Asia I’ve never had a problem with people knowing that I am American and never hide the fact. Never bothered about religion either. I’ve always been treated wonderfully. The vast majority of people on this Earth are good and helpfull. I find one of the great benefits of travelling to other countries is realizing that this is so. Thanks again for your great service. Later.